I love entering contests like this and would love the opportunity to create with these beads. Love those colors. Would like to win some pearls. I love these glass pearls. Would love a chance to win them! 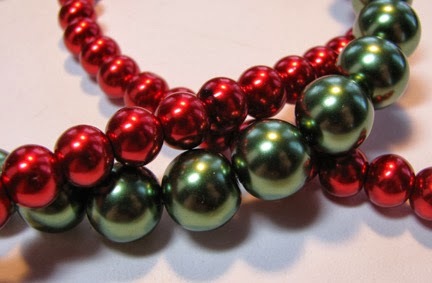 Great colors for holiday jewelry - would love to win these pearls. Ohhhhhh....Mama needs some new pearls! Pretty please count me in! I'm just beginning my beading journey and your site has been a great help! I've already made a few of your projects, and will be making more. Thank you for making these patterns (and these pearls of wisdom and pearls of glass) available! Thank you for the free tutorials. I was about to check out the beaded flowers when I spied the Christmas colored glass pearl giveaway. Add me to your list- I'm looking for beaded flower wedding arrangement patterns. I would love these, thank you!!! Just read a pattern I'd like to use, but it called for glass pearl beads...and I have none! What a happy beader I would be to win any strand that you offer! Hi I just started beading and I love to do ur projects. I incorporate glass pearls into my jewelry frequently, but I've never used the larger sizes before. This would provide me with the opportunity to go outside my comfort zone for sure! I would so love to compose with those beads! I already have ideas floating in my head, just waiting for those beads to come home to mama!! !